Dubai: A four-year-old boy named Shawn sat on the sidewalk crying outside the Dubai Multi Commodities Centre (DMCC) headquarters at Almas Tower in Jumeirah Lake Towers on Wednesday. “I could not talk to Kobe Bryant,” he sobbed as his mother tried to console him. Such is the appeal of the man they called the ‘Black Mamba’. The NBA star is among the richest athletes in sport, but when it comes to reaching out and connecting with his fans, he is second to none. “I think it’s a huge honour to be in this lovely place. 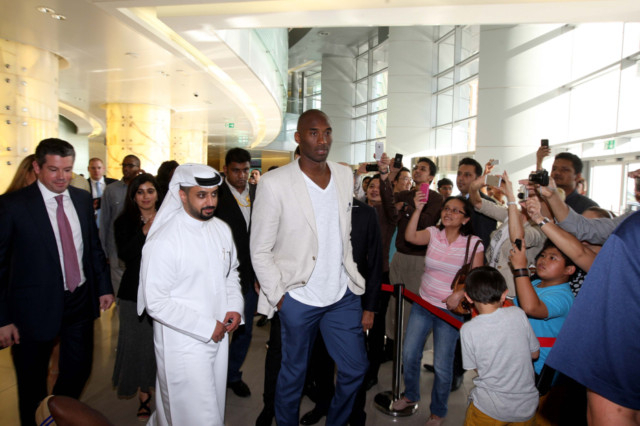 I like the idea of constantly challenging myself and every place I go I try and inspire people through sports,” Byrant told media here on the eve of his two-day ‘DMCC Kobe Bryant Health and Fitness Weekend’ in Abu Dhabi and Dubai. While questions of his Achilles tendon injury were few, Bryant was quite enthusiastic on relating his first-hand knowledge on diet and adhering to a healthy living. “Both my grandfathers were diabetic and today, when I look back, I can understand what they were going through,” he said. Now 35, Bryant exhorted people to follow a healthy diet and way of life. “When I was younger it was very easy for me to eat what I wanted. The hardest part of getting old is being able to change your diet. It’s a struggle with yourself, but it needs to be done. Held under the patronage of Shaikh Nahyan Bin Mubarak Al Nahyan, Minister of Culture, Youth and Social Development and Chairman of the General Authority of Youth and Sports Welfare (GAYSW), the health and fitness weekend will focus on diabetes awareness in the UAE. The two-day event, which will see an exclusive clinic for youth in Abu Dhabi on Thursday followed by a celebrity match at the American University in Dubai (AUD) on Friday, is being supported by GEMS Education in association with the Dubai Diabetes Association, Boston Diabetes Centre, Imperial College of London Diabetes Centre’s public awareness campaign, Expo 2020, GAYSW, Dubai Calendar, Duplays and Dubai Sports Council. The official media partners are Virgin Radio Dubai, Gulf News and Sports Talk magazine, while Kempinski Hotels are support partners.